Krylon is a brand of spray paint and clear finishes. Some clear finishes turn yellow after awhile so watch for "Non-Yellowing" types. Hi, thank you for your recommendations! 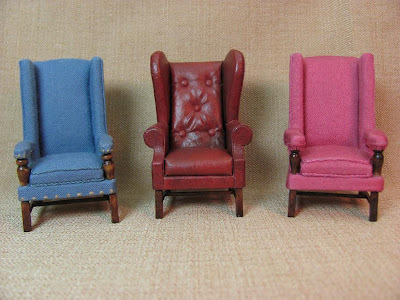 I used Bluette Maloney's aged leather technique on your chair and ottoman. This is fun to do and it's not particularly hard, don't get hung up on the last part with the darker paint, just do it. 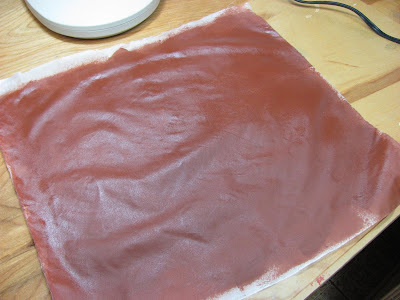 I am going to show how to make some books using the "leather" later on, too. Found the ottoman in my good old Ethan Allen catalog that I will post soon. I was first introduced to making aged and cracked "leather" by "Miniature Collector" in an article by Bluette Maloney. The article appeared in February, 2002. This "leather" I am making isn't aged and cracked. It looks like the "leather" on the half scale wing chair in the previous post. I tried unbleached cotton muslin, it is just too heavy and it won't get a sealed surface like the silk. I find silk blouses at Goodwill and other thrift shops. I used to pay, well, the last silk I bought was $18.00 a yard, silk batiste. I'm saving that, my kids will find it along with all of the other stuff I have saved!! I wanted to try out the muslin because it's easier and cheaper to get, although the last blouse I bought was $3.00 and that's a lot of silk. I am using Delta's Ceramcoat, I am sorry, I mixed 2 colors. I can't seem to not mix paint. 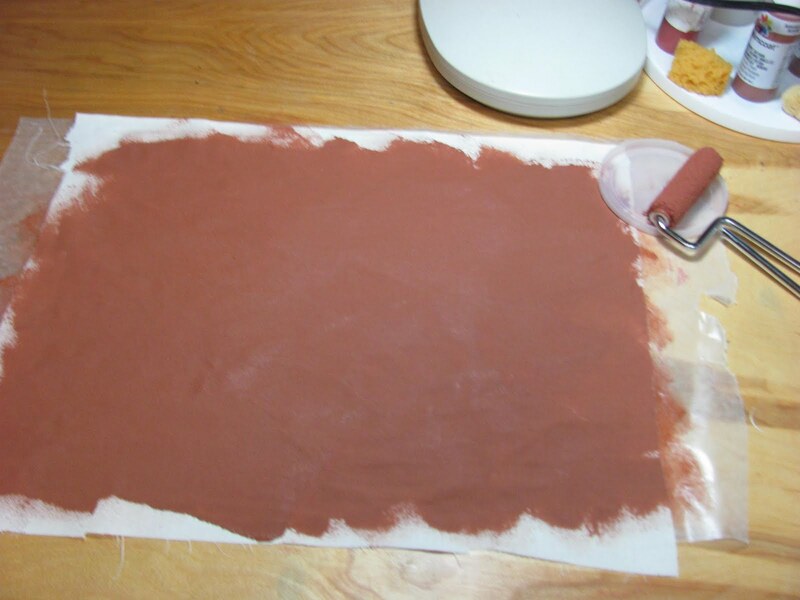 I used most of a bottle of Burnt Sienna, filled it (about an inch) with Dark Brown. Going to use Krylon's gloss spray, if you've got satin, that's fine. I use Krylon because it doesn't yellow. Then I'm going to use Folk Art Artists' Pigment, #504, Van Dyke Brown, it's the thick stuff. If you can't find Folk Art, use artists' acrylic in the tubes or a dark, dark brown in craft acrylics like Delta. I wouldn't worry about the color too much. You will probably find your own combination that pleases you. 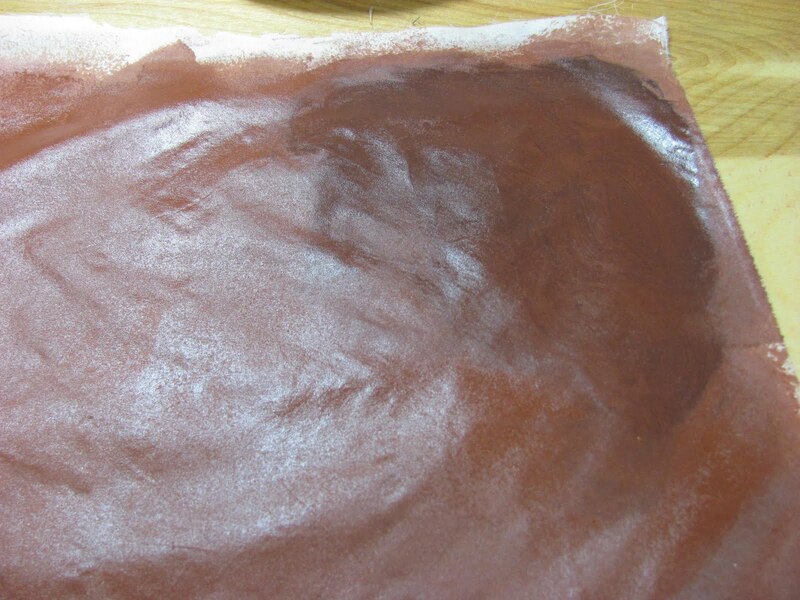 Get a glazing medium or acrylic thinner to thin the Van Dyke Brown and some wax paper to protect your table top. Tape some wax paper on your table top to protect it from the acrylic paint. 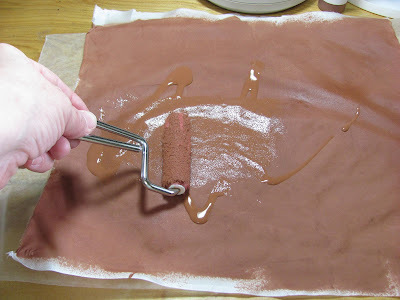 Lay the silk on the wax paper. 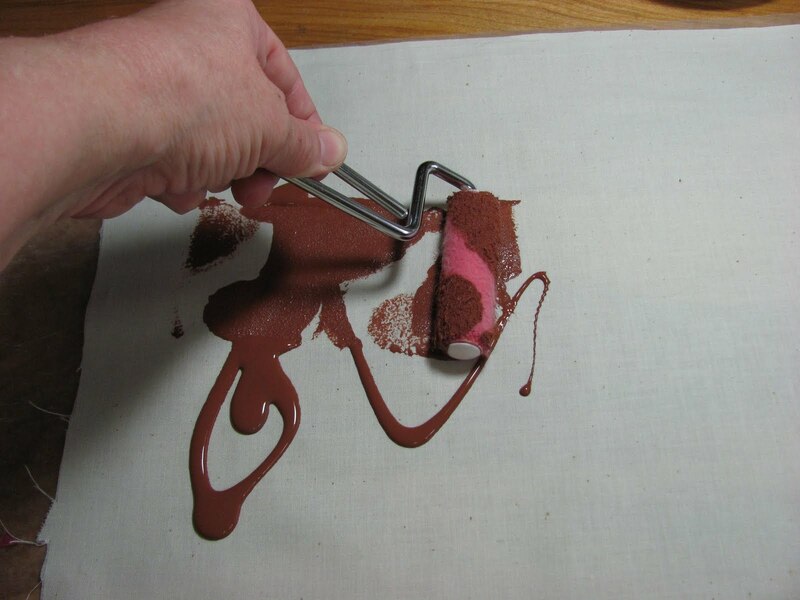 I squirt the paint directly onto the silk and roll the paint out. I would have rolled out to the edge but I was running out of wax paper so I couldn't put down a double row. Hang the silk up to dry. The silk doesn't take long to dry, be sure it's dry before the next step. Don't let the silk stay on the wax paper or it will dry to the wax paper. Throw away the used wax paper and put down a new layer. Go outside or in your garage and spray the silk with the Krylon. 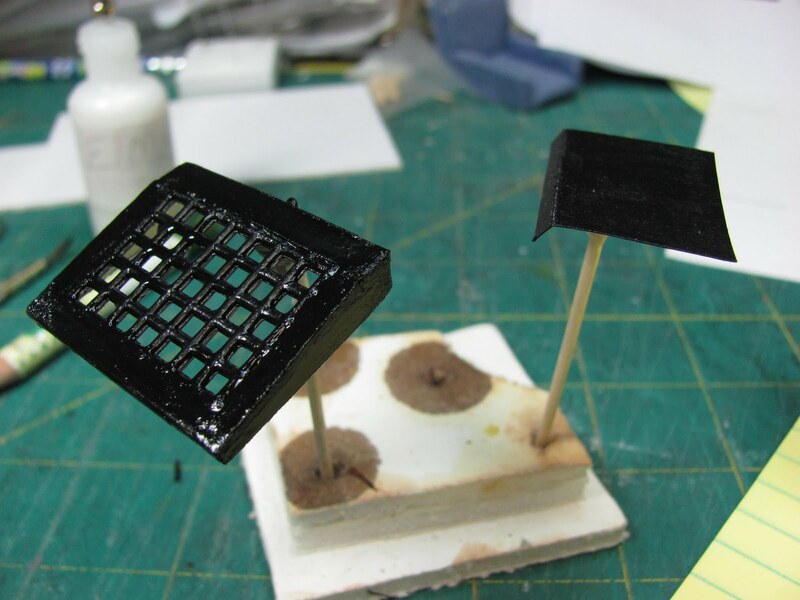 A couple of light coats should do it. Let dry. Give the silk another coat of paint, hang it up and let dry again. I used about a half of bottle of paint on this 12" x 12" piece of silk. When the paint is dry spray the silk with Krylon again. We want this sealed so let the first coat dry and spray again, let dry. You see, I have a little shine to the silk. The next part is kind of artistic to your taste. Play with it. 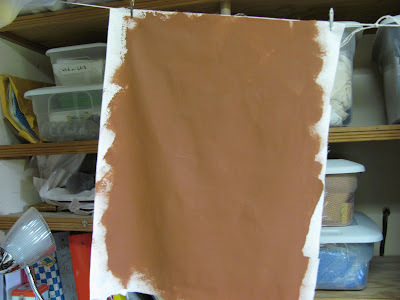 I'm mixing the Van Dyke Brown with (even if you are using regular craft paint) an acrylic thinner or glazing medium. We want to work with this a bit to get the surface color the way we want it. I mix half and half. I dip a small rag into the mixture and make circular movements in a small area. Go on to another area. You can loosen up the color a bit with some straight glazing medium, if you hurry. In the last picture you can see the Van Dyke Brown in the upper right hand corner. I does make the "leather" dark. You may want to play with different color combinations. That's why I suggest using thrift store silk blouses, I played a lot. Hang up the silk again outside or in your garage and spray with the Krylon to finish. Sometimes the "leather" doesn't look like much, but when it's on a piece of furniture your eyes just tell you it's leather. I store the extra "leather" on a cardboard roll, like the ones paper towels come on. 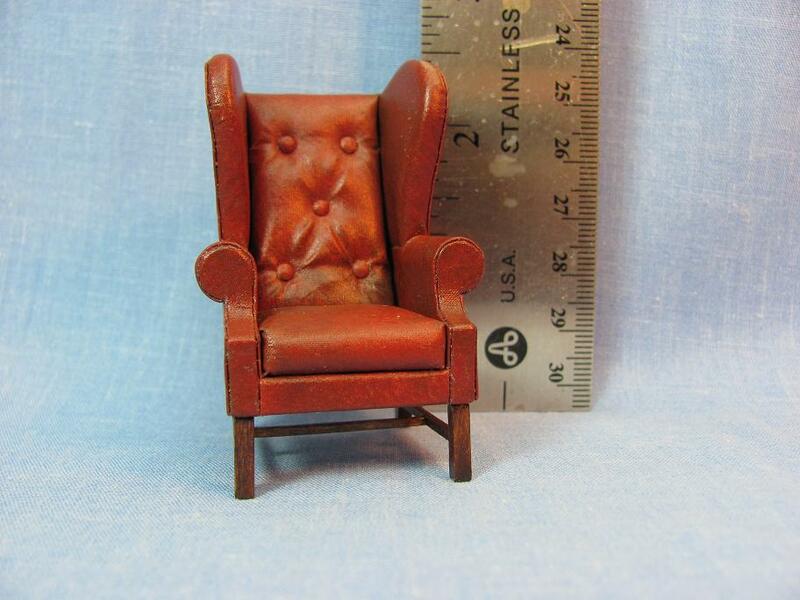 The "leather" on the half scale wing chair is red, I used Delta's Dark Brown on the last step to darken it. I have made other colors as well and they have looked good. I think you need to have a project to use your "leather" on, how about an ottoman? Here are all three of the half scale chairs. I had fun trying this out. It's not as hard as I thought it was going to be. 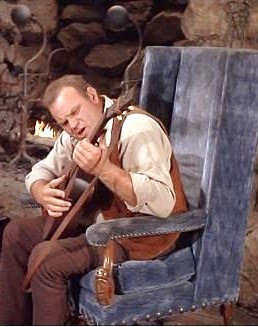 The Bonanza fan wants me to make a bookcase and sofa table, too. I am having fun helping with the furnishing of the Ponderosa! I guess I can say I will make half scale upholstered furniture, too. Obviously the gravity baseboard registers aren't universal! Sorry to rest of the world, we old Americans just think everybody has what we have. With this internet I am learning all kinds of things. I am getting together the leather technique in about a week. I want to get the last half scale chair done and I've got more okra and tomatoes to can. I will then be going to Chicago to visit my daughter. Yes, I take the pictures with one hand and have the other in the picture. One picture does have both hands that my son took for me. He didn't think I could do as well as I do. I wrote a couple of machine knitting books for the Passap knitting machine and took all of those with a 35 mm SLR, one hand on the camera and one hand demonstrating the technique on the machine. He just doesn't know what his old mom can do, does he! 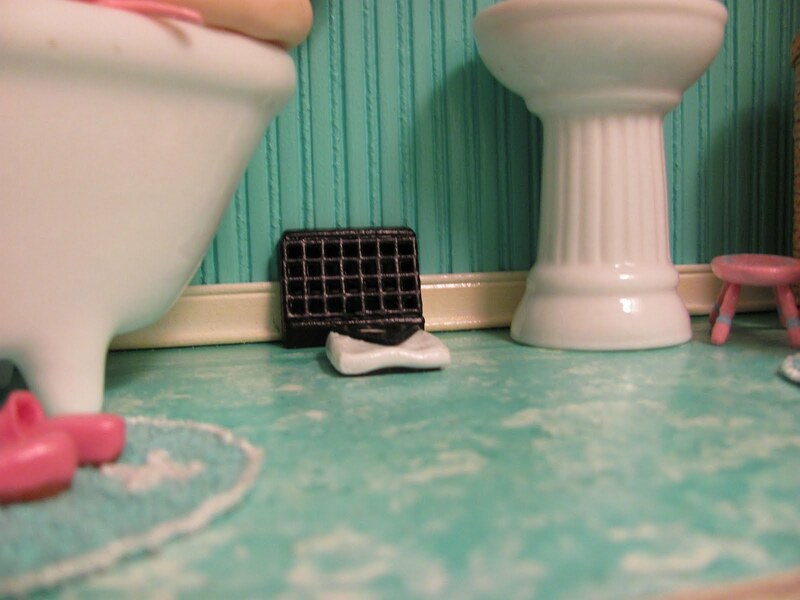 What is a gravity baseboard register? 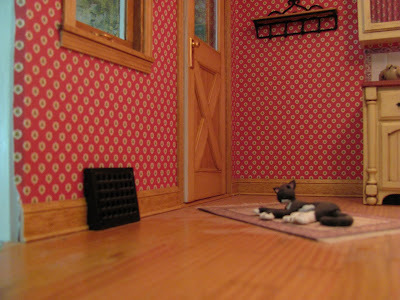 I have added baseboard registers to a couple of my room boxes and I think they add to the realism of the scene. Now, if you are a real stickler for realism these only go on the inside walls. Sometime after WW II they started putting the heat registers on the outside walls but back when this style was used they were put on the inside walls. But you will notice that I put one of mine on the outside wall. I wanted one in the room and all I had was the outside wall, so it went on the outside wall. 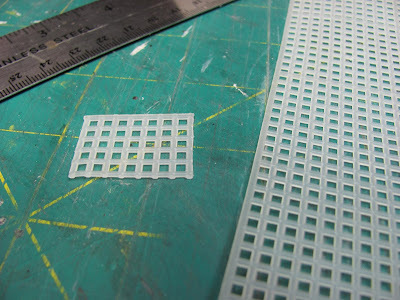 Cut out a rectangle of plastic canvas, 5 holes by 7 holes. 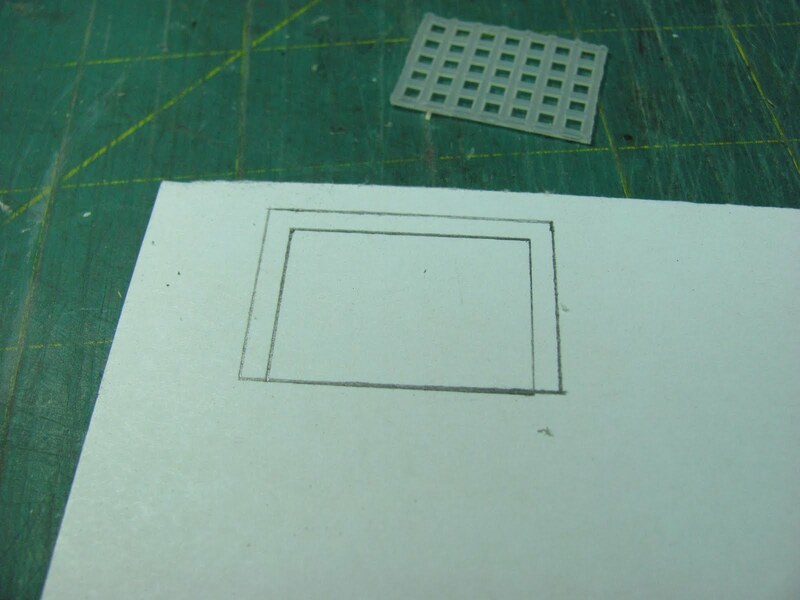 On the mat board draw a rectangle 1 1/8 " by 13/16". Around this rectangle draw a border 1/8" on 3 sides. Cut out the center piece and discard. 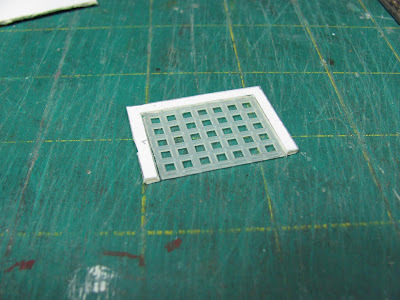 Glue the plastic canvas into the rectangle using tacky glue. Set aside and let dry. 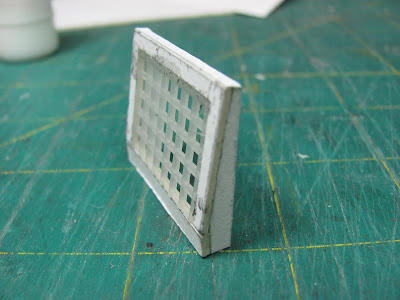 At the top of the blog is a diagram for the sides. Draw the sides onto the mat board and cut out. 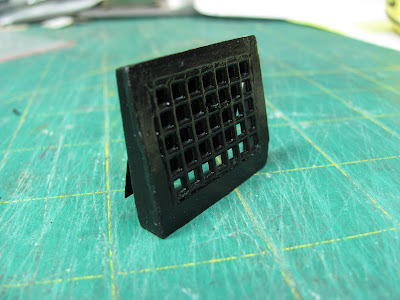 Glue the sides onto the grille assembly. I used Elmer's for this and the rest of the gluing. 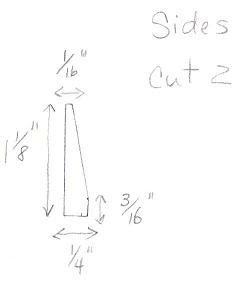 From mat board cut out a bottom front 3/16" by 1 3/8". Glue this to the bottom front of the register. Cut from card stock a top 1/16" by 1 3/8" and glue to the top of the register. 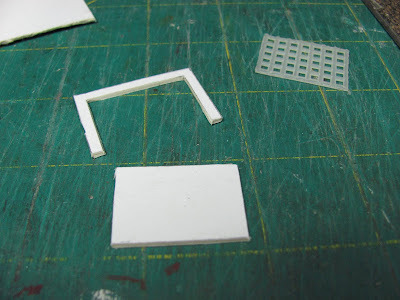 Cut the inside flap from card stock, 1 1/4" by 1", dry fit, you made need to trim a little from the sides. 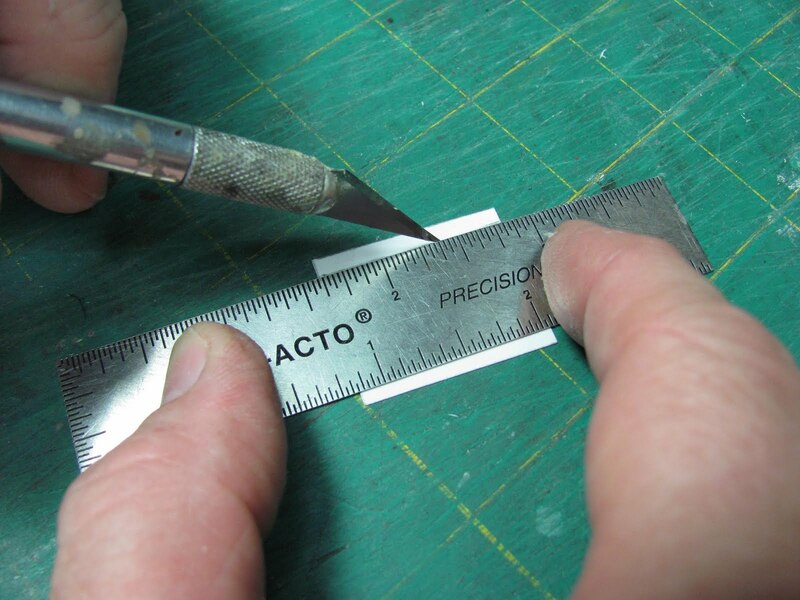 With the back of the Exacto knife, score a line 1/8" down from the top. This 1/8" space will be glued inside at the top of the register, not now, though. Paint everything black. I used Delta's Perm Enamel, I wanted a little shine to it. After the first coat I sanded a little to smooth things out and painted again. 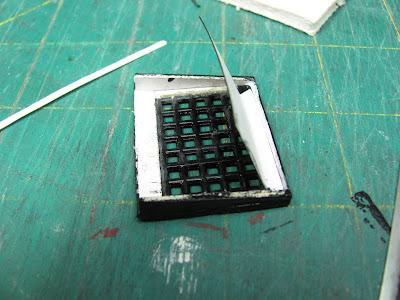 To hold the pieces I put adhesive wax on toothpicks and then press the wax onto the register parts. We need to make a lever to open and close the flap. This is card stock. 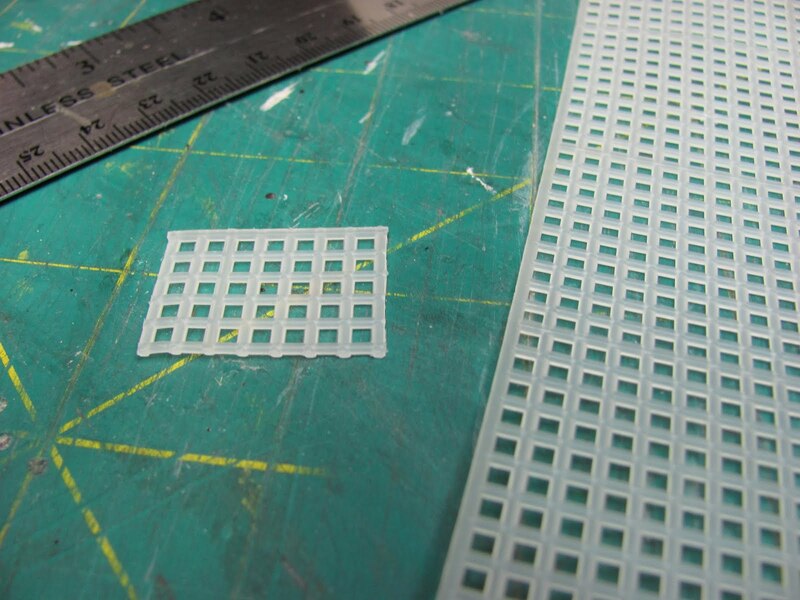 Cut a strip a little wider than 1/16" and cut it for now about an inch long. Glue the flap into the inside of the register. Measure from the rounded end of the lever 1/4" and 1/8" more. Cut the lever off at 3/8". Bend the lever at the 1/4" line. 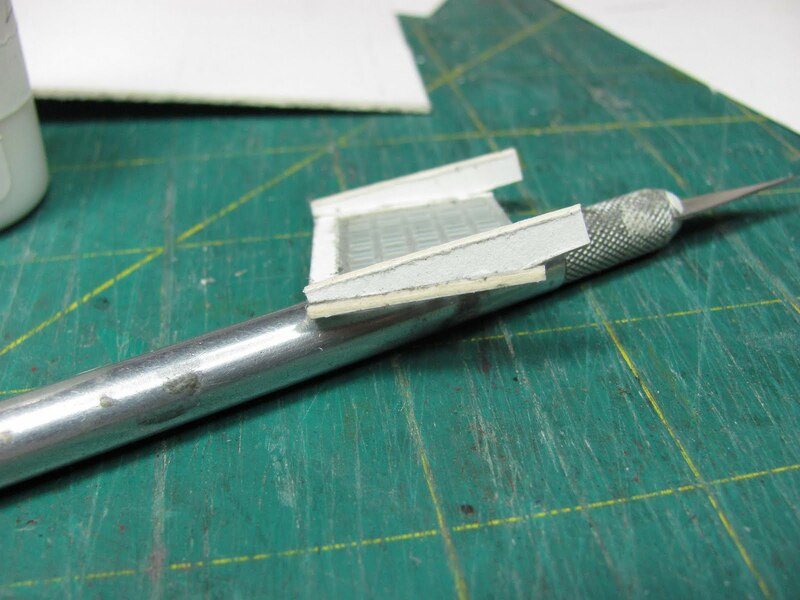 Use tacky glue to glue the lever to the flap at the second row form the top and in the center. When the glue is dry, paint the lever and install the heat register so your people don't get cold in the winter! Next time we are going to make a flower arrangement with daisies. 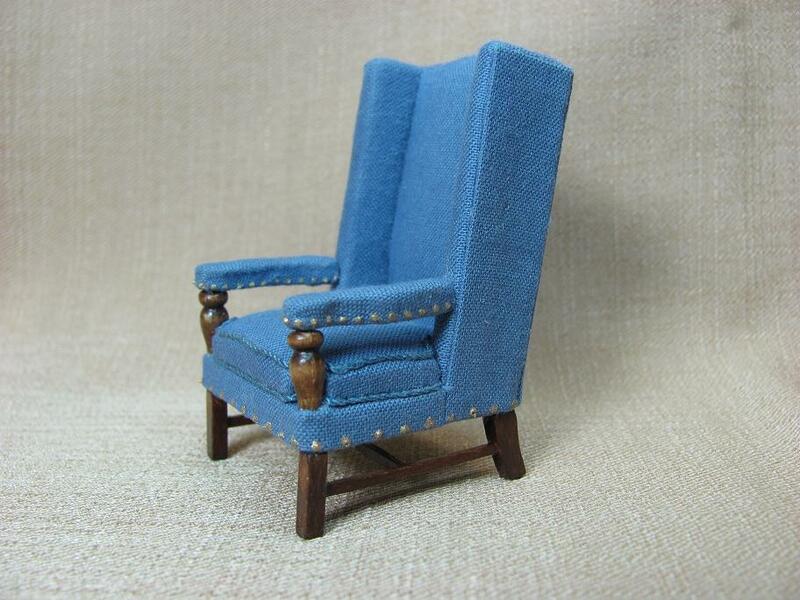 First Half Scale Chair, 2 More To Go! First of all I have to answer Ira, I have never heard of such a thing. But all animals are different. We had a dog that would remove the pickles from her hamburger and the black olives from her pizza. I don't know how she could eat a piece of pizza and leave the black olives, I don't even know how she could tell what the black olives were. Now, we are talking real farm dog here. She would kill a chicken from the neighbors and hide it and bring it out now and then to chew on! And she wouldn't eat pickles or black olives. I am sorry if I grossed anyone out. Good dog, though! O.K. Iris from Charlotte. I tried the stationery thing. I went to Google Images, found a piece of stationery, right click, save image. Opened the folder that I saved it in, right click on the picture, and chose "open with", chose paint. Made sure everything was on one page by opening file and choosing "page layout". Now I clicked on the text button, double clicked where I wanted the box. I chose a font and size, larger than normal. I typed my letter. Next, I clicked on image and reduced the size of the letter by choosing resize/reskew. I would check print preview to see the size and printed a couple out to check. I was happy with what I got. I couldn't read the letter, ofcourse, but you could see the writing. Charlotte is trying to make some pretty stationery for a French country house she is decorating. If anyone has any more ideas, correct anything I left out or where she can go to get printies for this please let her know in the comments for me. Ira, what on earth do the dogs do to the berries? They don't eat them do they? When my husband weeds the garden, the donkeys, if they are on the other side of the coral start hee hawing, getting excited over the weeds they will be getting. After that they just hang their heads over the fence to receive the treats! Got a tiny egg yesterday, one of the new chickens must have started laying. Al, that's my husband, is taking out the spring garden stuff that's done and putting in the summer garden, more beans and some beets. I don't know what else he's putting in. Trying out lots of new stuff to keep without having to preserve it. Dried my onions and put them in jars to use later. I will put pictures up of the half scale chairs when I finish them. 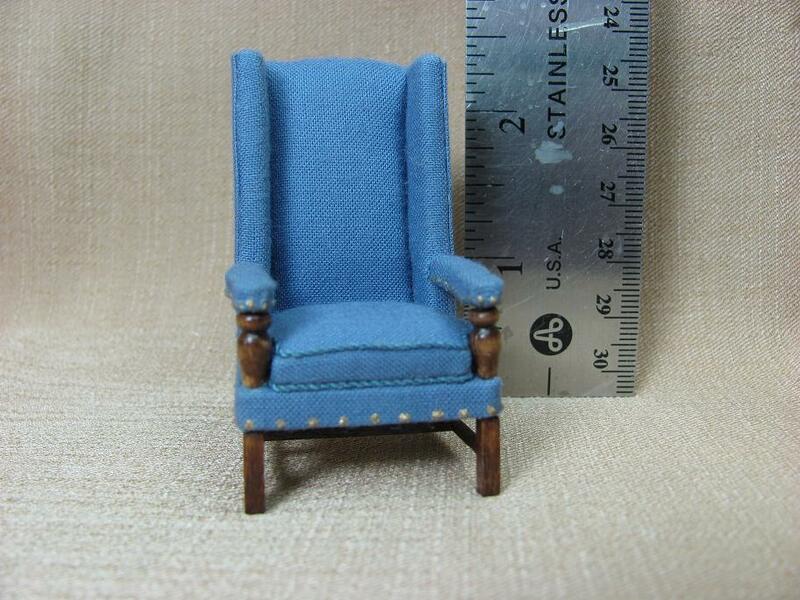 I am working on a set of half scale chairs, gosh this stuff is tiny! I can't imagine working any smaller. I like looking, but the making is tedious. I have the picture of Fidg in my workroom, I don't look at it a lot, but he's there. My little chickens are grown up and out with the others. We have always had Buff Orpingtons, a heavy breed. These new chickens are Barred Rocks, a black chicken with white bars on them and not a heavy breed. So every night I have to get them some of them out of the trees. One night I left a couple in and my husband heard a ruckus and got up to find a raccoon had gotten one and took it down to the barn. He saved the chicken and I don't leave any chickens out anymore. The donkeys are doing fine, my husband is training them to haul brush and logs for us. The logs we cut up and use for firewood, we have a wood burning furnace. They have finally settled in. The greedy behavior they had when they first arrived is gone. They know they will be petted, brushed and treated again, it's not the sanctuary where they had to compete with over 200 other horses and other assorted animals. The blackberries are coming in and this year they are as big as your thumb. I will be putting up jelly with them. Thank you to Dangerous Mezzo, I corrected the url for the suede paper. Have any of you tried it out? There is an article out there about what I do on the blog! How cool is that! I would have never have thought about that, but I don't move around a lot on the net. Thank you for writing about my blog and I hope everybody that has started following me will have fun, I will try to keep it interesting. www.woodworkersauction.com . They sell other things, but the rugs are really nice. Remember, I use suede paper from www.dragonflyintl.com. When printing I used Windows Photo Gallery, and under paper, I chose "other specialty paper". I hope this helps for the paper jam difficulties you might have. I also gave the paper a press from the back side, paper side with a hot dry iron, not the cotton setting, the one under it. I've been doing all right with it. I also use the paper that we use for our dollhouse ceilings, it has a plaster like texture. I buy it in a roll from wallpaper sections at the big box stores, I got mine from Menards, it's cheaper to buy it in a roll. 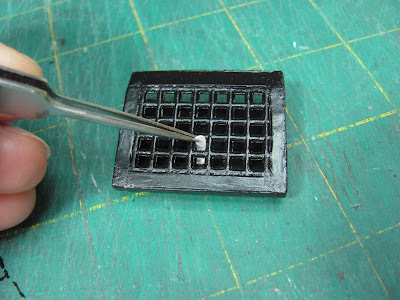 It's the same stuff, the dollhouse supplier people buy it and cut it to sell to us. It makes nice rugs, too. Go the the blog entry, Rugs, to find out what I do to finish these off. This stuff makes great quick rugs, I spray them with a matt finish and when you glue the muslin underneath and fringe it at the ends the rugs really work in the room. I just wanted to log on to let you know that I am still here. 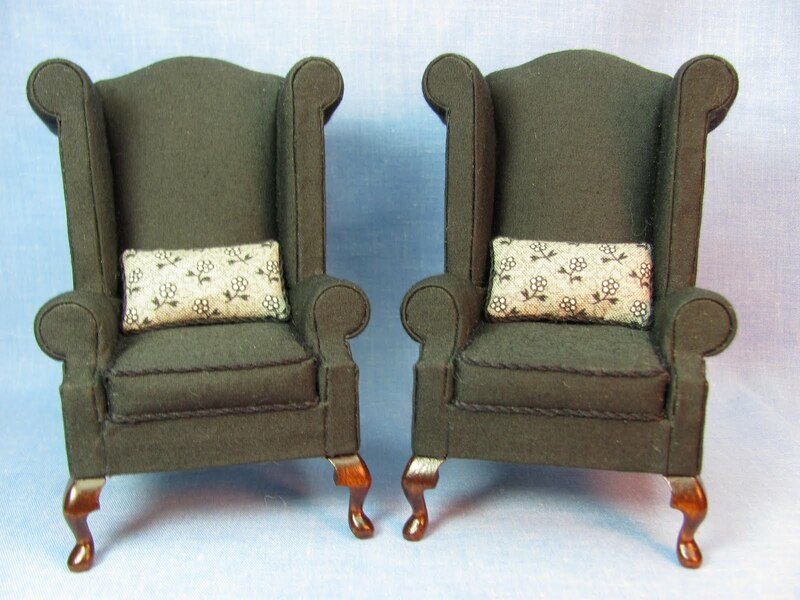 I have just finished a custom order for a pair of Victorian Gothic wing chairs that will be going into Edgar Allan Poe's house in Finland, he's moved I believe, Ha, Ha!! 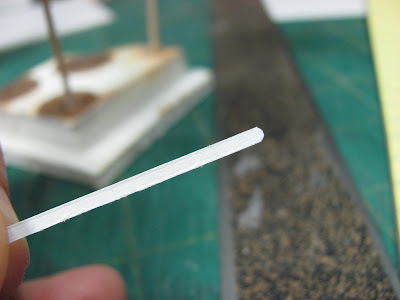 I have another custom order for half inch scale, I haven't made anything in this scale so it's going to be an experiment. This order is for the Ponderosa, yes, Pa, Adam, Hoss and Little Joe. Their house is made from Legos and is the most amazing thing I have ever seen. http://www.youtube.com/watch?v=VaGfYusRVvE, I would make a link but I haven't been able to make one out of the Blogspot site. I don't know very much about computers. I have a project for you and will be posting around the 20th again.